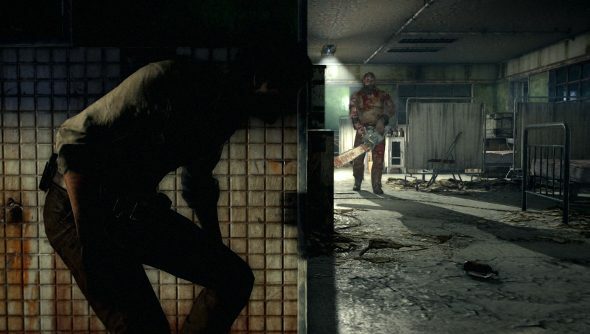 The Evil Within launched today, and I hesitantly stepped inside the gore-filled world to see if the absurd VRAM requirements and bizarre limitations that Bethesda has been sugar-coating as part of an artistic vision crippled this port. Lamentably, they have. I’ve done a fair few Port Inspections, and this is one of the worst. Little consideration has been given to the PC version, and the significant issues mar what could be a rather entertaining, if silly, horror game. Things get off to a bad start immediately. The game launched in windowed mode, so I immediately hit up the display options to switch to fullscreen. There, I was greeted with a pitiful list of options. It’s no wonder that the game is devoid of preset graphics profiles, because there’s almost nothing to change. AA, shadows, motion blur, SSAO, shadow quality and reflections are the only items on the list, and fiddling with them produces only very minor alterations. It’s barely worth the comparison screenshots, but I’ll show you them anyway. Leaving the options and jumping into the game proper, things don’t get any better. The ridiculous aspect ratio that creates gargantuan black bars that would make even films look silly is the first thing one is likely to notice. They take up about a third of the screen. With such a tiny space to view the action, the 30fps limit is even more obvious, and it’s one of the few times that this limitation has made me feel nauseous. 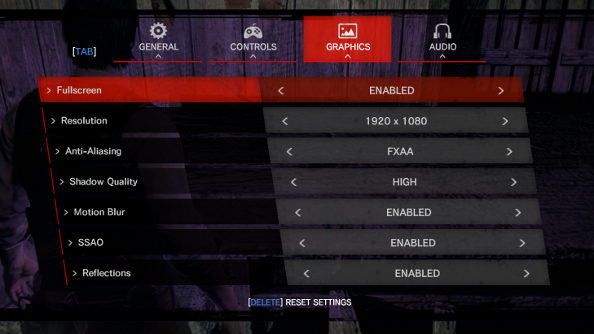 The game doesn’t support higher frame rates or other aspect ratios. This is part of the development team’s vision – a sluggish game where you can only see a bit of the screen. Tweaking can be done in the debug menu, though. You’ll need to go into Steam, right click the game, select “properties” and then “set launch options”. Type “+com_allowconsole 1” and you’ll be able to activate the debug menu in-game using Tab. This is actually very handy, and Bethesda has provided a list of things you can fiddle around with. 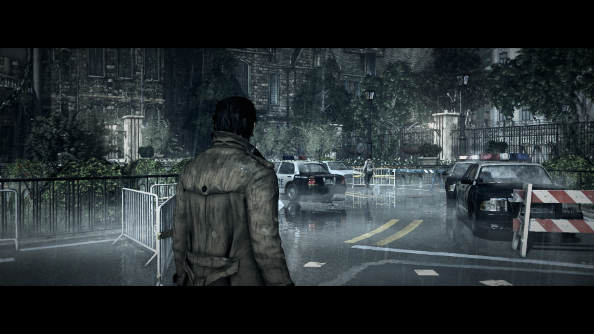 Unshackling the frame rate made a huge difference. With everything maxed, I was getting between 40fps and 50fps most of the time, and there weren’t any real noticeable spikes or dips. This seemed quite reasonable given that my rig is below the “recommended” system requirements, even though they are inexplicably high. Changing the aspect ratio is also very simple, but produces a far less welcoming change. It buggers up the FOV entirely, so you’re essentially playing the game zoomed in the whole time. Your choices are: play the game with a third of the screen cut off, or play the game zoomed right in. Bethesda’s announcement about the obscene VRAM requirements caused a lot of confusion, and frankly, it’s still confusing. My VRAM usage never went above 1500MB, even when every option was at its highest setting. And with only a very small number of options to tweak, it is not at all clear why there’s such a massive disparity between the minimum and recommended system requirements. 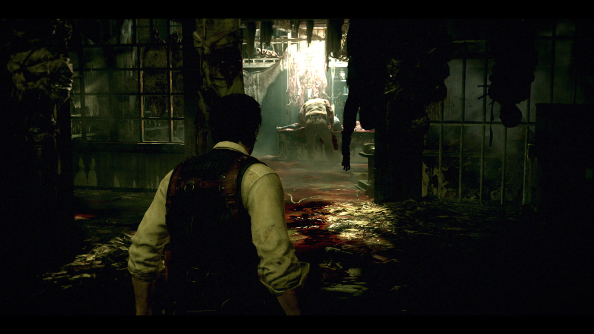 The Evil Within can be played with mouse and keyboard along with a gamepad, and really either option works fairly well. However! There is of course one annoying hiccup, because nothing seems to work flawlessly in this bloody game. If you do choose to use a mouse, be warned that navigating the menus will be a pain in the arse because of some serious input lag. I didn’t notice this outside of the menus, though. So it’s not too sluggish, though Detective Castellanos certainly is. The only positive thing I can say about this abysmal port is that it does a great job backing up what I wrote last night, where I said that the “cinematic experience” is a nonsense term and isn’t achieved by frame rates. 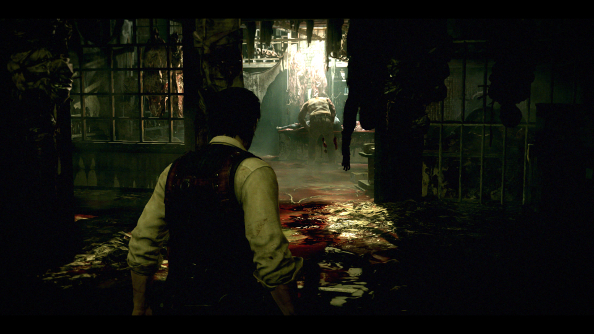 The Evil Within’s film grain makes it look more like a film than any hideous letterboxes or poor frame rates, and it’s a bit annoying too, though at least it can be changed in the options.